Let's learn Chinese with Coco! A million thanks to Rachel!!!! Noun. Means "husband" or "a man". Together doesn't make sense in the Chinsese context but if there's a meaning to this combination of words, I guess it's "a man's hand" or " a man's arm". - According to Rachel. * All four nouns are found in the Traditional Chinese glossaries, except this one which is an expression of the Cantonese dialect. 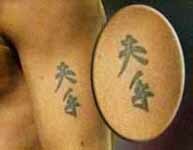 If you read the characters from top to bottom, from left to right, it's a sentence which carries a meaning of "mother and father love elder sister". - According to Rachel.